Hey guys! Matthew Weiss here — weiss.sound.com, theproaudiofiles.com/members, and mixthru.co. This is going to be the first installment on a series on editing. We’re going to be talking about editing backing vocals to the lead vocals.Now, editing is something that we tend not to get too excited about, but it’s much like the fruits and veggies on our plate. It’s maybe not the most exciting thing in the world in some respects, but it is extremely good for you. In fact, I would say editing is the unsung hero of a successful record. So what I’m going to do is I’m going to play you this record as it came in, and what I want you to do is listen to the syncopation of the backing vocals to the lead vocal, and then I’m going to show you my edit and dissect what I did, why, and how, and I really want you to take note of this, because while it isn’t the flashiest subject, it is probably one of the most important and also most overlooked. So when I hear this syncopation between the backing vocal and the lead vocal, it sounds a little sloppy, and sometimes sloppy is intended, and sometimes it’s not. In this case, I don’t believe that it is intended, so I did some editing, and here’s what it sounds like now. So it’s still maybe not the tightest in terms of this first set of adlibs here, but you know, there’s only so much I can do. I might go back in and try to tighten it up a little bit more.I want to talk about the second set though, very specifically. So I’ll demonstrate this in a second, but basically I start with a visual cue. I look at where the start of the words are in the waveform, I then listen to hear how the two sounds come together, and then I make a determination as to whether or not I need to change anything.Now, sometimes you get something that is distinctly different, but isn’t meant to be changed to be the same. In other words, it’s intended to be different. Sorry, that was weird. But sometimes you get things that are intended to be different, and it’s very important to make those distinctions, so I want you to listen to the very last word in this phrase. The word DJs sustains significantly longer in the ad-lib than it does in the main vocal. I believe that’s intentional. I think the artist did that on purpose. It creates a cool sort of contrast effect, and so I’m not going to do any kind of elastic audio time stretching to shorten the duration of the ad-lib.I’m going to leave it as is, because that’s the effect that was intended. So we have to be thinking pretty consciously about what’s supposed to be moved, and what’s correct as is. 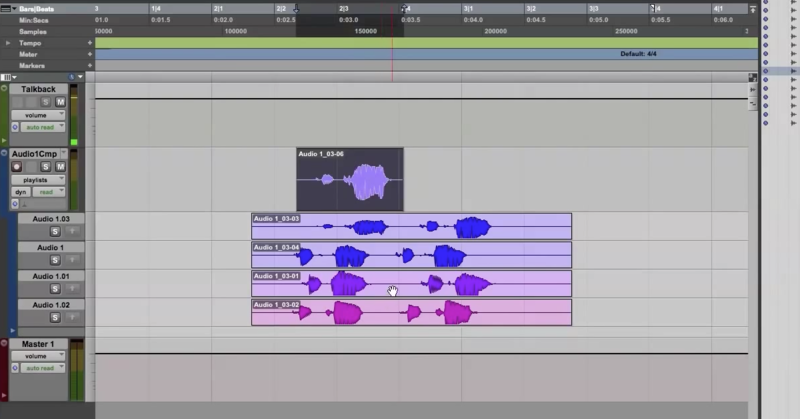 So now I’m going to edit a vocal phrase in real time for you, just so I can go over some of the points, and also show you some of the quick techniques. It’s not the hardest stuff in the world, but it’s important to know how to do it, so here we go. Okay, so that’s our phrase. And you can hear that the timing is distinctly different, and not in an intentional way. So what I’m going to do is I’m going to zoom in on the waveform, and here I can see that — here’s our lead, saying mix/master, and here’s our backing vocal, and they’re very different in terms of where they’re sitting. So the first thing I’m going to do is I’m going to cut this segment, because this is what’s really mostly off, and what I’m looking at and seeing is that the duration of this word “mix” is significantly longer than the duration of how it is in the lead vocal. So I’m going to switch over to elastic audio, and the first thing I’m going to do is I’m going to shorten the word a little bit. Alright. Now, I’m going to slide it into place. Okay. And shorten the start of this word right here. Now the next thing I’m going to do is I’m going to crossfade right at where this meets. I still want to shorten this up a little bit so that it starts at the same time, so I’m going to cut a new region, I’m going to slide it over and crossfade again, and I’m on a very tight crossfade, so I zoom in very tight. Cool. Alright, so there we go! That’s editing backing vocals to a lead vocal. The other thing I should say too is that lead vocals in rap tend not to need as much editing as lead vocals in pop. Usually, when things are out of time in a rap lead, it’s deliberate. Occasionally, I’ll nudge something here or there, but pretty rarely, because that loose pocket is usually intentional, or is at the very least, part of the feel of the song.